Spend over N1,000 on UBills. Daily winners would be announced via social media at 12:00pm every Friday. All Entries end on May 31st Sunday 11:59pm. 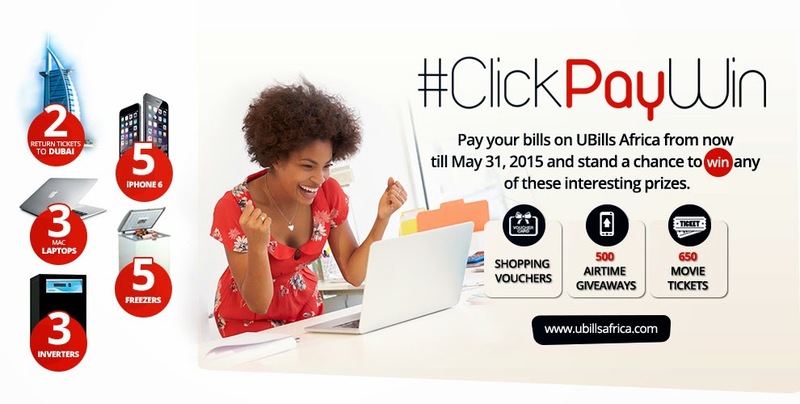 Follow us @UBillsAfrica on Facebook and @UBills_Africa on Twitter and share your experience on these platforms by tagging us with the #Clickpaywin #UBillsAfrica hash tags. All entries end on Sunday May 31st at 11:59PM. United Bank for Africa shall be entitled to publish the names of winners in its publications and marketing materials. Daily winners would be announced via social media at 9:00am the daily. Grand prize and monthly prizes will be redeemed at the UBA branch close to the winner. The Prizes are not transferable or exchangeable for cash or credit or in kind whether in part or in full. Any Prizes that remains unclaimed within a period of three (3) months after notification of the prize Winners has been made will be forfeited. To the fullest extent permitted by law, UBA expressly excludes and disclaims any representations, warranties or endorsement, implied or express, written or oral, of all Prizes offered under this Campaign, including but not limited to any warranty of quality, merchantability, fitness for a particular purpose, health and safety. All risks, loss, damage and/or injury associated with the use of the Prizes shall be assumed by the Winners. Where applicable,Winners are encouraged to obtain adequate travel insurance coverage to protect themselves against such loss, damage and/or injury. UBA shall be entitled to vary, delete or add to any of these Terms and Conditions or any part thereof and/or substitute or replace the prizes offered under this Campaign and/or to extend, modify, shorten, discontinue, cancel, terminate or suspend the Campaign by giving adequate notice to Eligible Participants. No compensation in cash or any kind shall be given to the Eligible Participants for any losses or damages suffered or incurred by the Eligible Participants as a direct or an indirect result of such variation, deletion, addition or alteration of these Terms and Conditions and/or the extension, modification, cancellation, suspension or termination of this Campaign. Promo runs from the 16th March, 2015 to 31st May, 2015.